The sanitary system follows the principle of the classic HEWI design: The style of System 815 is based on basic geometric shapes. Elements made of curved steel emphasise the discreet design of the sanitary system and give it istlightness. Despite the minimalist use of material, System 815 has a convincingly high-quality, fine look and feel. 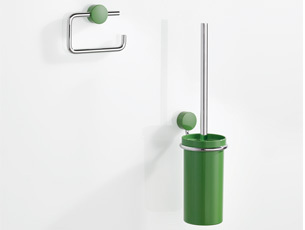 The system is available with a high-gloss chrome finish or as a combination with high-quality polyamide. The design specification for bathrooms is still frequently: timeless and plain. In the bicolor variant HEWI provides 16 good reasons against this. 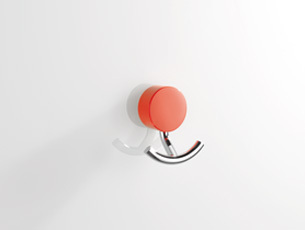 With System 815 you set coloured accents in the bathroom – unobtrusively and yet individual. The circular fixing elements made of polyamide are available in all HEWI colours. 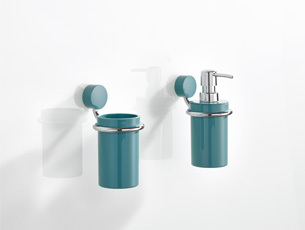 The inserts, for example, soap dispensers or tumblers, are available made of coloured polyamide or satin finish crystal glass. 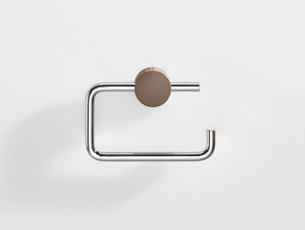 System 815 includes accessories for the washbasin, toilet and shower and can be combined with comfort elements such as stools or support rails. The System 815 accessories are available in all HEWI colours from April 2017.